Sony Alpha A-99, displaying the beautiful full-frame 24mp sensor. While there are many worse things than being compared to great camera like the A77, the new full-frame Sony boasts a number of features beyond the size of the sensor. 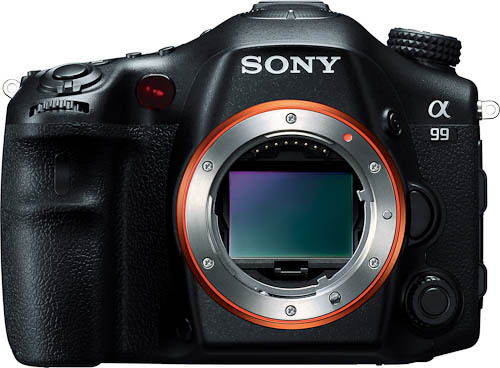 Starting with the sensor, the A99 is equipped with a new Sony 24.3mp Exmor CMOS chip. While this is roughly the same pixel count as the A77, the larger sensor makes for larger pixels, which should result in superior noise reduction. As far as the other features mentioned above, the A99 includes Sony’s all new..eh, old?…hot shoe design. While I think this is somewhat of a step backwards, it does mean the Sony A99 (as well as the brand new NEX 6 ) will be able to utilize more flash and flash accessories. Presumably this the future for all Sony dSLR/SLT cameras, so get used to it. There is also a brand new, top of the line Flash unit (Sony HVL-F60M Flash) equipped with the proper shoe for the new mount. Don’t worry, if you own older Sony/Minolta flash units, there is a new, inexpensive Multi Interface adapter to mate these flashes with the new camera. Being a SLT translucent mirror camera, the A99 lacks a traditional optical viewfinder. The electronic view finder (EVF) offers an interesting improvement over optical finders of the past. Like previous full frame Alpha (A900-A850) you can use crop-sensor lenses on the body. You will get a lower resolution image, but it works. With the EVF, however, Sony created a system that automatically detects whether you are shooting with full-frame glass or not. If you attach a crop-sensor lens on the A99, the viewfinder automatically enlarges the image to show you a 100% view of what the lens sees in the viewfinder. Switch to a full-frame A-mount lens and the view will adjust itself again, showing you 100% view of what the full-frame lens sees. Try that with an optical viewfinder. Since this is a pro-level camera, it needs pro-level auto-focus and it seems the A99 has that in spades. Sony claims the A99 is the first digital camera from any manufacturer to include a dual AF system. The main focus system features a 19-point AF grid with 11 cross sensors. The Sony engineers have backed this up with an a 102-point phase detection sensor that is overlaid on the image sensor. The result is a system that Sony says uses both phase-detection sensors to create an extremely fast and accurate AF system. Time will tell, but I am pretty excited about the potential of dual AF system. Another thing the A99 has going for it is weight — or rather the lank of it. Sony is touting the A99 as the lightest 35mm full-frame dSLR on the market. The body of the camera tips the scale at 740 grams (26 ounces). Not bad for an ultra-full-frame camera. The ISO range is 100-32000. Because this is full-frame camera, which creates much larger files than APS-C frame cameras, the frame rate is limited to 6fps. That is pretty impressive, but pales next to the Alpha A77, which can crank out a full 10fps. If you absolutely have to have faster frame rate, the A99 allows you to shift into an APS-C mode. At this setting, the A99 actually captures APS-C size images instead of the full-frame 35mm size files it would normally gather. While you will end up with lower resolution images, you can shoot at the same 10fps as the A77. It’s a trade-off, full resolution or fast frame rate. I like having options. The A99 is Sony’s first full-frame camera to offer video recording, as the A900 and A850 lacked video capture. Although the A99 should produce excellent still photos, Sony certainly didn’t overlook the videographer. in addition to he most advanced video AF system in a dSLR, the A99 features a silent dial that allows users to adjust settings such as f/stop and shutter speed without adding noise to the film clip. The A99 makes up for whatever was missing on the previous Sony flagships, offering 60p, 60i and 24p HD video modes. When you done shooting, you can output uncompressed 60p and 60i HDMI footage. After Sony killed off the highly regarded A900, some commentators voiced the opinion that Sony was done with the high-end; that the company would be content to play in the advanced amateur level and leave professional level cameras to other manufacturers. The A99 demonstrates why it is dangerous to listen to the pundits. There are a few things that could be improved on the A99 (wireless radio trigger for one), but overall the A99 is full-featured as well as full-frame. This entry was posted in Sony Alpha, Uncategorized and tagged A-mount, A99, Alphatracks, digital camera, EVF, Photography, Sony Alpha, Sony Alpha dSLR, Tom Bonner, Translucent Mirror, Video dSLR. Bookmark the permalink. Post a comment or leave a trackback: Trackback URL.